Don’t like your desk setup? Wishing you had a better Mac, or maybe a more stylish desk to work at? Do you ever long for a more ergonomic workstation that aids in a productivity surge? Well folks, remember this picture, because your desk situation could be worse – a lot worse – you could be sharing one single desk in the most awkwardly possible way like this ridiculous double-decker Mac setup. Is this the most awkward desk setup ever? 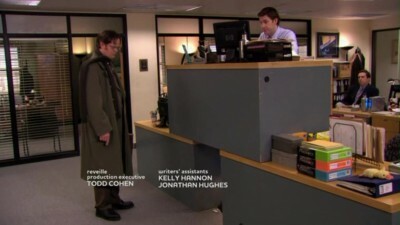 If this isn’t a joke, which is entirely possible, then this has to be one of the worst desk ideas ever, not just for ergonomics, but for safety, productivity, and let’s face it, for anything else. Can you imagine this as your desk setup? Yikes…. And no,this is not quite a typical Mac setup picture post or feature, but it’s just too funny to pass this up. This one easily gives this guys ridiculous stacked MacBook setup a run for it’s money. Though we’re not entirely sure where this originates, heads up to @MarkGurman for the find on Twitter, what a riot. If you’ve seen a similarly awful / hilarious desk arrangement or Mac setup, send it our way, we’d love to have another laugh! at least he’s got a trash can up high too. This is ridiculous and unfortunately not that uncommon. These guys had nothing else to do, so they shammed this? looks like the guy on the bottom is doing a Red Hat / Fedora install..
That looks like the blue anaconda kickstart screen. 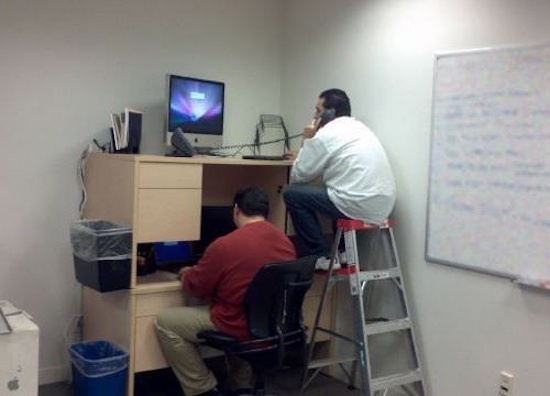 If the top desk falls, the bloke on the bottom has his hands crushed and his computer wrecked, while the guy on top has his iMac written off, but retains use of his hands. What would you rather have to pay, a minimum of £1000, but retain the use of your hands, or pay a few hundred pounds, and have your hands completely smashed?